Let Aqua-Tech create the swimming pool your family deserves. Enjoy a better place to call home for years to come. Choosing a custom in-ground swimming pool from Aqua-Tech is a decision to craft a place to make memories, relax and entertain for years to come. Your investment will result in an outstanding final product delivered by from experts with unsurpassed experience and standards. 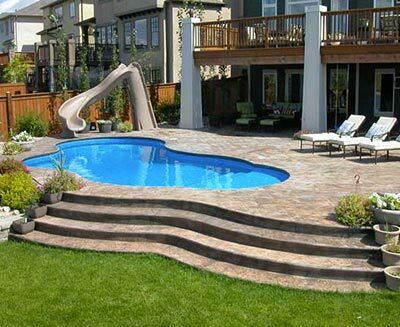 Our custom in-ground pools are as unique as our customers, and you’ll never find two alike in Winnipeg. Your Aqua-Tech pool will be designed with you and for you, incorporating your family’s unique personality and your home’s existing design. Our designers, project managers and technicians work together and maximize the possibilities available within your budget. In our 30 years in business, we’ve gained valuable experience and insight to bring you a stunning final product–why settle for anything less than an Aqua-Tech pool? You might be more familiar with in-ground pools being installed in a traditional rectangular shape, but a unique design can add to the value of your home while utilizing available space, increasing privacy and orienting it toward the sun. With Aqua-Tech’s award winning custom swimming pool design team, the possibilities are endless. From modifications on classic Roman, Grecian or kidney shapes, to rare and one-of-a-kind designs, or sleek, calming pools, your dreams will become a reality when you select a custom in-ground pool from Aqua-Tech. 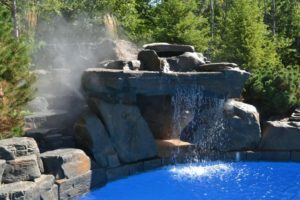 Every single Aqua-Tech pool is different and when you visit us for your consultation, we’ll discuss which features are important to you: from unique stairs and custom stonework to light shows and fire features. Regardless of your main reasons for choosing to install a swimming pool, our outstanding craftspeople will create and build a pool to meet all of your needs. Our precise, high quality work guarantees that regardless of complexity and the innovations you’ve selected, you’ll have a pool you’ll love for decades. We work with the best suppliers in the industry, granting us access to the newest products and most innovative options on the market. We can incorporate bubblers and waterfalls–a perennially popular choice with children. We have considerable experience designing grottos, splash pads and water walls. If you’d like a chef’s quality outdoor kitchen or glamorous beach entry, Aqua-Tech will make it happen–all in just two to six weeks. There’s no swimming pool Aqua-Tech can’t make into a reality–isn’t it time to let us create the one you deserve? Get in touch today to discover how simple it will be for us to bring your backyard dreams to life. Request Your FREE Consultation with a Swimming Pool Designer! Explore the custom swimming pool design options available only from Aqua-Tech. Discover how your pool will maximize available space, your options for waterfalls, custom stonework, tanning ledges and more!